Vinyl siding, poplar, paint, motors, wiring, hardware, steel, tubing and torn printed images of sewn collages, 50 x 20 x 10 ft.
Vinyl siding, linoleum flooring, steel, motors, wires, tubing, wood, paint, digital prints of collages on paper, hardware, 50 x 20 x 10 ft.
Pigmented, cast plastic, 9 x 16 x 14 in. 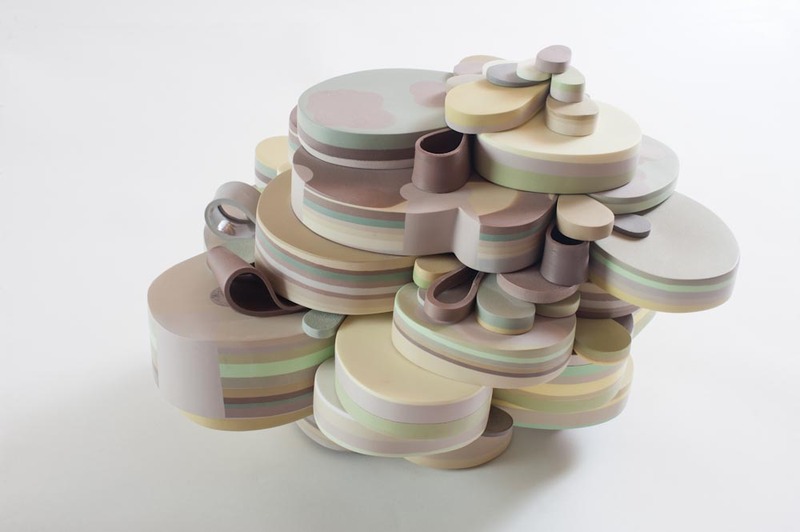 Pigmented, cast plastic, 10 x 15 x 14 in. Cut acrylic sheet, latex paint, hardware and plastic cast of sewn drop cloth, 68 x 60 x 7 in. 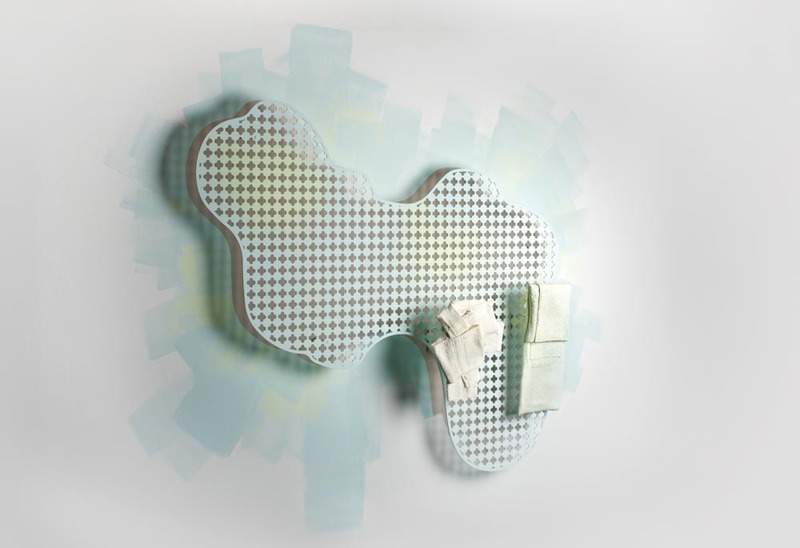 Cut acrylic sheet, latex paint, hardware and plastic casts of hand towels, 70 x 72 x 7.5 in. Cut acrylic sheet, latex paint, hardware and plastic cast of upholstery fabric, 66 x 66 x 8.5 in. 30 in. x 26 ft. x 34 ft. Fans, paint, electrical cord, hollow plastic casts of pillows, hardware. Dimensions are dependent on the installation space. Construction paper, MDF, hardware, painted containers, projected four-channel video, edited audio, by Sia, 20 x 60 x 42 in. with projector. Construction paper, MDF, hardware, painted containers, projected four-channel video, edited audio, track by Sia, 20 x 60 x 42 in. with projector. 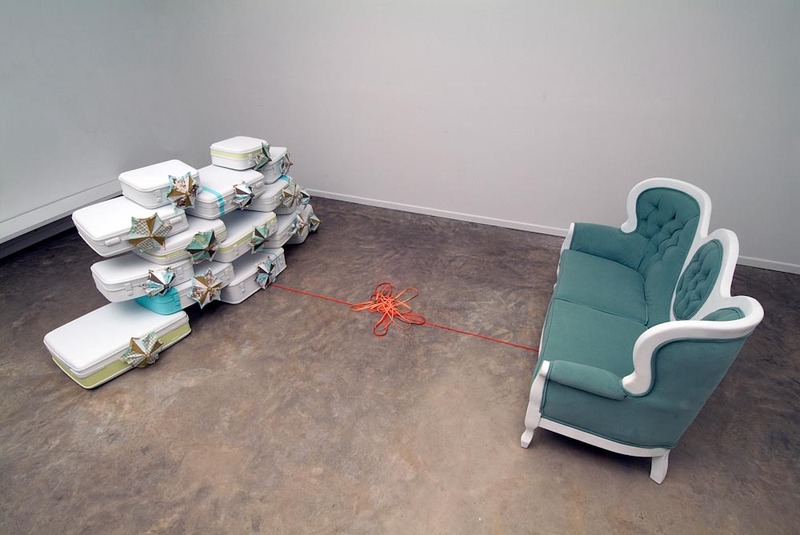 Reconstructed settee, resin, paint, vintage suitcases, umbrellas, fabric, motors, pressure sensors, wood, MDF, electromechanical parts and orange cording, Installation in an 18 x 15 x 18 ft. space. 480 digitally manipulated photographs on cut and folded cardstock, oscillating fan, paint and wall. 20 x 15 x 8 ft. including the wall. 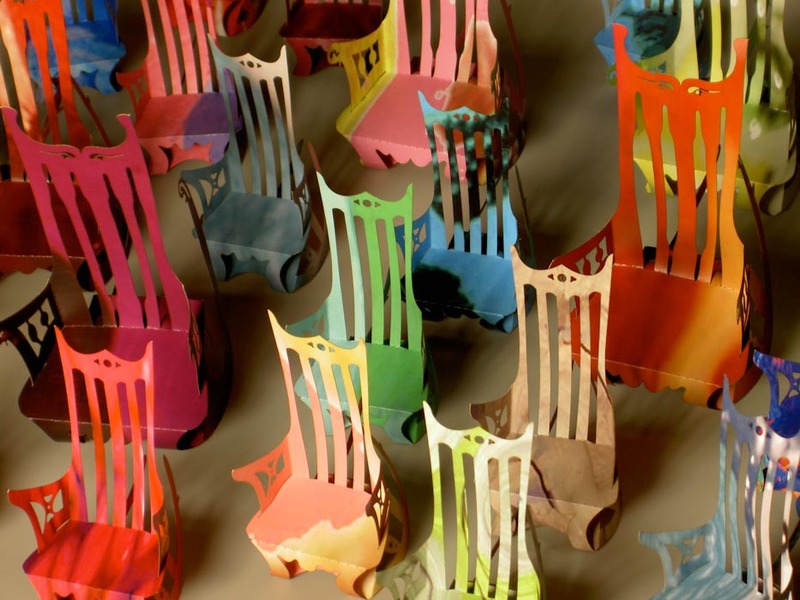 The folded paper rocking chairs are 5 and 7 inches tall.